Gov. 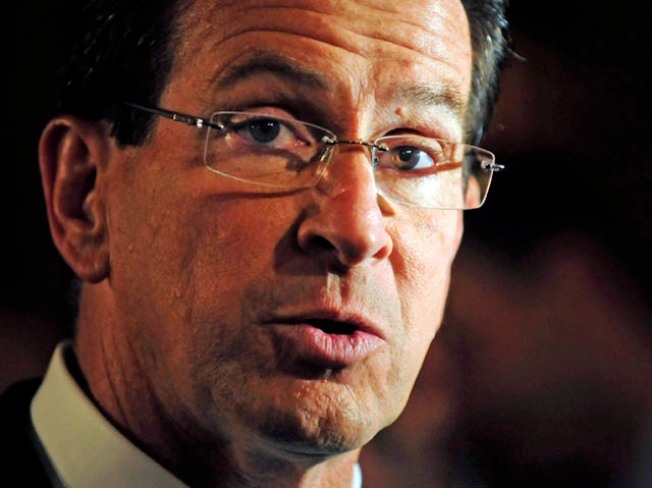 Dannel Malloy presented his budget address on Wednesday, touching on everything from business to education to the taxes paid. Malloy proposed an earned income tax credit of 30 percent. For a low-income family of four, would be $1,700, he said. Fully fund the state’s pension obligations. Reduce governor’s staff by 15 percent and eliminate new longevity payments for the people in his administration. Cut $2 billion in concessions from state employees over the next two years by moving state employees to a health benefits package like the one that covers federal employees to save more than $100 million over two years. State employee wage freeze: save almost $300 million over two years. Adjust the retirement age: save close to $300 million. First Five initiative: offers incentives to the first five companies that bring more than 200 new jobs to Connecticut. No reduction of funding for local education. Form a committee to recommend smart steps to overhaul the way we fund local schools and report to Malloy on Oct. 1. Pre-kindergarten education a reality for every child in the state: $5.7 million over two years -- leveraging approximately $4.1 million from private philanthropic sources, including the Graustein and Annie E. Casey Foundations, as well as the Child Health and Development Institute. Reform of teacher tenure rules -- invest more than $2 million to build the student data and teacher accountability systems – to give schools the f lexibilty they need to retain new, talented teachers. Magnet schools: $60 million to provide for more than 8,000 additional seats, $6.5 million for 747 additional charter school seats, $7.2 million for more than 1,300 new seats in the OPEN Choice program and $50,000 to fund a Regional Educational Service Center to study ways communities can regionalize transportation services to save local dollars. Transfer the State Vocational Technical Schools to the local districts and regions that host them. Full funding of the ECS grant, increasing it by nearly $100 million in the first year, and even more in the second. Provide cities and towns with a tenth-of-a-percent sales tax on retail sales to the town where it is collected: raise $24 million, as well as the hotel tax and the tax on car rentals, and expanding the local conveyance tax. Funding 38 new rail cars for Metro North and Shoreline East. Convert Medicaid programs to a self-insured model, saving up to $80 million per year. Add smoking cessation to services covered under Medicaid. Use federal revenue from provider tax for nursing homes and direct that money to the homes. The deficit, he said is projected to be more than $3.2 billion next year and $3 billion the year after.